Providing Wi-Fi for 20,000 people in one room has a unique set of challenges that manufacturers have struggled to solve. Enterprise Wi-Fi has evolved nicely and with the right configuration and tuning, users can have a clear expectation of service. Enterprise design can even be stretched to service large auditoriums with a few thousand people. Walls and other barriers in offices help to limit the range of the radios and allow good reuse of the same channels in different areas. In the 5 Ghz band, there are only 21 unique channels which can be further limited by radar avoidance requirements. In the 2.4 GHz band there are only three channels (1,6,11) that don’t overlap, but unfortunately this band also shares with Bluetooth and other devices such as wireless keyboards creating a lot of interference and background noise. While 802.11ac channel bonding allows for ever increasing speeds, for my application, I don’t care about this. I need to give 10,000 people (50% take rate) 10-20mbit bursts or streams so they can post photos or increasingly, stream with Facebook Live. My users are 99% handheld mobile devices and the use case is primarily social media. There are some laptop users in the press box, but that is a more easily controlled area and environment, though still exposed to the bowl. Stadiums and arenas with large open bowls and stepped seating don’t have barriers to limit interference. A number of solutions evolved that helped, one of which was under seat mounting. The human bodies in this method act as nice attenuators and help to isolate interference with other radios so that you can reuse channels without worrying too much about interference. Some stadiums have elected to install radios in the handrails along the seats. This is slightly easier to install but does not limit the range quite as well. In an arena, we have the advantage of being smaller which can allow for installation of antennas on the catwalks in some cases. At 100-150 feet, these antennas must be very narrow beam width, ideally 30 degrees or less to limit the footprint. Depending on the attendance, you can end up with a lot of reflection which could cause interference with radios on the same channel in another part of the bowl. If you have 150-200 radios, but only 21 channels to share, there is going to be a lot of noise. Recently Panasonic ( yes, Panasonic ) announced a new system that is one of the best advancements I’ve seen to deal with this sort of environment. When the product manager was pitching me on it, he got about 10 minutes into the pitch and I stopped him and said, “you can stop, I’m already sold.” The reason I was so interested can be summarized in three things; multiple radios per ‘panel’, narrow band AND beam antennas, and an independent data plane. The first point, the Everest system AP1004NRe is a large stadium antenna (think 17″ laptop) that has 1 x 2.4 GHz (don’t care, won’t use) and 3 x 5 GHz radios (now we’re talking). The panel has two ethernet (NBASE-T 2.5) ports to deliver up to 60 watts of power. In my use case, I’m never going to need that much bandwidth for a panel, even with three radios in operation. Again, I need density, not throughput. Having three radios in a single structure reduces the number of antennas we need to mount, a good thing when concerts roll in and need to hang rigging from the steel catwalks. This panel allows me to serve three clients simultaneously even without MU-MIMO (which would only help with a few Androids at this time anyway(future article to be linked)). Second, each antenna band and beam is very narrow. The beam being narrow gives it a spotlight effect improving gain and reducing noise, that’s not rocket science. What really excited me about this was the narrow band. Rather than tune each antenna to 5.2 – 5.9 (rounded for nitpickers) Ghz, they decided to break that up into smaller segments, think 5.2-5.4 rather than 5.2-5.8 tuning. I’m not sure how they accomplished this, but in concept it allows for much better rejection of noise and can extend the range. This wouldn’t be useful in some environments, but in the arena bowl, this is a great idea. It helps to extend the range and signal to noise ratio, important when trying to hit the floor for a concert. Third, they decided to send separate the data and control planes. The controller still communicates with the radios, but user Wi-Fi traffic will VLAN trunk directly to its gateway rather than via CAPWAP tunnel. This is more efficient for our environment and also means that if the controller goes down, the users can continue to stream. Not the only vendor who does this, but a nice feature. One other feature of note is some direction beam forming that allows you to digitally steer the beam up to 15 degrees. It supports plenty of other industry standard features, but these are the ones that really sold me. It is the system I had in my mind had I been able to design one myself from everything I had learned. Cisco has made some steps towards this with the 3802p radios and stadium antennas. 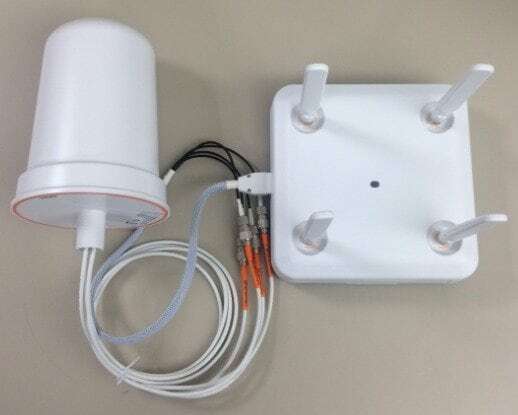 In that case you can run dual 5 GHz radios on one base with an extension cable (sorry pic is omnidirectional example for some reason) to a second antenna. An improvement, but requires 3x the physical antenna installation of the Panasonic system for the same coverage. I’m not sure which system I will end up with as I already have 160 Cisco radios spread around the arena and I could definitely improve coverage with 120 more 3802p radios in the bowl. The bowl is such a different environment that I am not opposed to having one system in the bowl and one for the rest of the arena. In the end, as most things do, it will depend on how things fit into the budget. Either way, I’m impressed with Panasonic’s thinking.